Goals from Jack Handy and Corey Graham secured the points for the Gunners. Wanderers reduced to 10 men after Captain Rob Greenlaw came off injured. No substitutes were available. Gunners extend lead at the top of the table to 12 points with 6 league games remaining. Match Report By Will Lethbridge. The Garrison Gunners extended their lead in the World’s Smallest Football League to 12 points on Sunday morning with a comfortable 2-0 win over the Woolpack Wanderers. Ahead of play on the Garrison Field the conditions were pretty good. It was a dry and sunny morning with little wind. Despite a fair bit of rain over the previous week, the pitch was in decent shape. Time news wise, both teams were down to the bare-bones. Both teams were able to field full starting elevens but neither team had any substitutes. Gunners star striker Joel Ware and Wanderers midfield maestro Jack Stone were still away on “international duty”. Other absentees for the Gunners included Dan Ware, Lewis Brown and Adam O’Neill, while the Wanderers were also without Dan May, Scott Reid and James Wignell amongst others. The Gunners were delighted to welcome Liam Greenlaw back. The Gunners won the coin toss and elected to kick upfield, towards the Garrison Campsite in the first half. During the early exchanges, both teams created a few half chances. Wanderers keeper Eugene Hogan made a few straightforward saves from distance while Sam James saw his strike from just outside the area go narrowly over the bar. The Wanderers created a good opportunity 10 minutes in. Will Lethbridge cut inside and pulled the ball back to Joe Greenlaw 8 yards out. The ball bobbled off the surface just as he was to connect with it. Disaster struck 20 minutes in for the Wanderers. Captain Rob Greenlaw pulled up with a hamstring strain. Despite trying to play on he was unable to continue and with no substitutes, the Wanderers were forced to play the rest of the match with 10 men. They adjusted their shape but lost their momentum and naturally fell back behind the ball. The Gunners started to make the extra man count and forced Eugene Hogan into a few saves. There were limited opportunities for the Wanderers, which came mainly from set pieces. They did well to make to half time all square. Despite the Wanderers being down to 10 men they regrouped during the interval and started well. Sam James hustled the ball in the Gunners area and put a cross in from the right of the area. Will Lethbridge’s header went just over. After 10 minutes of the second half, the Gunners started to make the extra man count. They were chasing the ball down and the Wanderers were struggling to string passes together due to the pressure. As the half progressed the Gunners started to pin the Wanderers back and started to create chances. Eugene Hogan in goal for the Wanderers produced some fine saves to keep the Wanderers in the match. The Gunners missed the target on a few occasions. Corey Graham came incredibly close in when his shot from close range looped up, hit the bar and went over. At one stage it looked like it wasn’t going to be the Gunners day! However with 20 minutes to go Jack Handy gave the Gunners the lead. After a quick counter down the right, the ball was pulled back from the by-line. Eugene Hogan made a fine save from close range but the in-form striker was quicker than anyone else to react and calmly slotted into an empty net from close range to give the Gunners the lead. The game opened up further as the Wanderers attempted to press forwards and ultimately they would be caught out on the break. A counter down the Gunners left resulted in the ball being whipped into the area for Corey Graham to finish from coolly from 6 yards. The Wanderers claimed for offside but the goal was given. In the final stages of the game, neither side had many chances. Ultimately the better team won. It was always going to be a difficult task for the Wanderers with 10 men. The Gunners extend their lead to 12 points with 6 games left in the league. It’s looking like an uphill challenge for the Wanderers. Thanks to all for turning up and to Paul and Crockett for officiating. As far as performances go Jack Handy looked dangerous throughout the proceedings and reacted well to grab the opening goal. Liam Greenlaw worked tirelessly in midfield, winning the ball back and setting up attacks. Wanderers keeper Eugene Hogan did well to keep the score down and Joe Greenlaw put in a heck of a shift in midfield. Gunners Captain Anthony Gibbons gets the Man of the Match award this week. A clean sheet, a solid overall performance in defence and the centre back took the ball out well. Back to league football next week! The Gunners have a 12-point lead. Is it too little too late for the Wanderers? 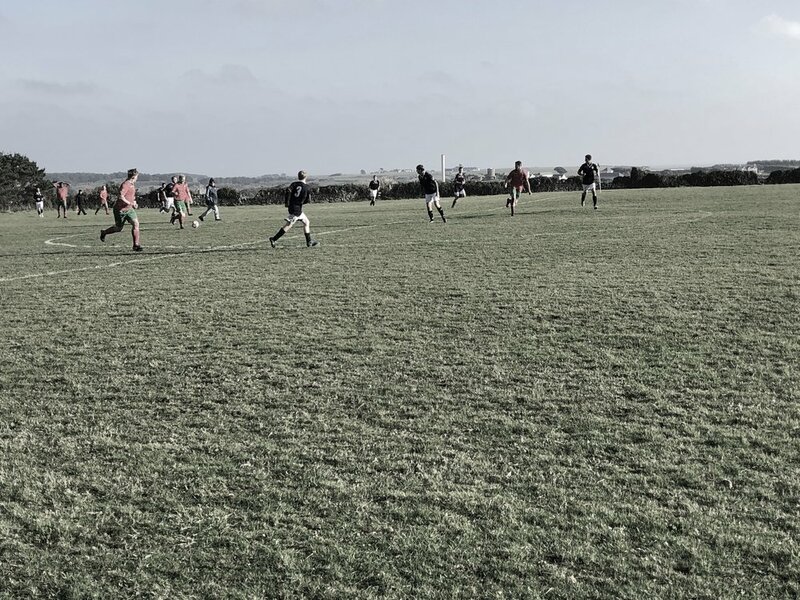 10:30 KO – Sunday, 10th February, Garrison Field, St Mary’s, Isles of Scilly.